LONDON, Oct 16, 2018 - (ACN Newswire) - WARC, the global authority on advertising and media effectiveness, has today released the latest edition of its Media Allocation Benchmark report, identifying the typical budget split of highly successful campaigns. Using its database of effective advertising campaigns, WARC has analysed close to 840 case studies between 2009 and 2017 that contain budget and media allocation information for TV, digital, print, out of home/experiential and other media. - Successful brands have spent an average of 69% of their budgets on television and digital channels combined over the 2013 - 2017 period. - The biggest determinant of media allocation is the size of the budget. Successful, prize-winning low-budget campaigns are highly digital-focused. At high budget levels, TV takes up more than 60% of a prize-winning brand's advertising investment. - Media allocation varies by sector. Categories with low budgets, such as government and not-for-profit, are highly digital-led, as are transport and tourism; a category where consumers increasingly purchase online. - The food category has the most concentrated media investment profile. Prize-winning food campaigns allocated 81% of their budgets to TV and digital combined. Commenting on the findings in the report, Amy Rodgers, Research Editor, WARC, says: "Gaining the right balance of TV, which delivers reach, and digital, which supplements reach and aids activation, is a critical component of media allocation. The findings suggest that, when extra budget is available, it is often invested in TV." 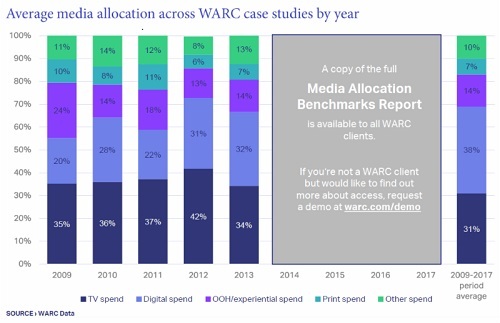 A sample of WARC's Media Allocation Benchmarks report is available to download on https://content.warc.com/read-media-allocation-benchmarks-report-2018-sample. The report in full is available to WARC subscribers on https://www.warc.com/content/article/Media_allocation_report/110231.